Going on an overnight adventure with your ATV or UTV gives a whole new meaning to the term 'packing light.' While many of todays UTVs offer significant carrying capacity, you don’t want to bog yourself down with 300 pounds of camping gear. If you’re going solo, you want to make sure and maximize the limited space available by bringing compact and lightweight items whenever possible. While a wide range of attachments is available, including some tow-behind trailer options that provide virtually all the comforts of home, we like a more minimalist approach to camping. If roughing it is more your style, we’ve got a few items just for you. This is by no means an all-encompassing list, just 10 useful items that will make life on the trail a little more comfortable all while saving precious space and weight. 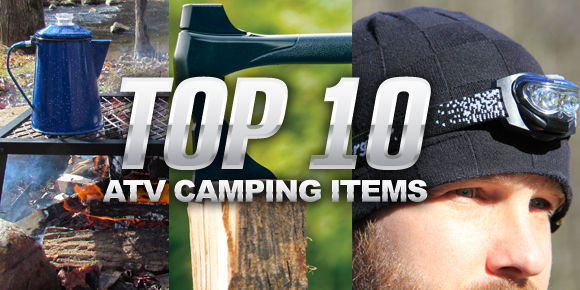 Read more about the Top 10 ATV Camping Items at ATV.com. This would be first on my list! Takes care of most of the items on their list right off the bat. Last edited by Dragula; 04-06-2015 at 07:18 PM. I am actually considering a toy hauler for next year as we have now collected 3 four wheelers and we intend to some camping....Having your own place is always best. Although I do not want a 5th wheel one,,,I already have a 24' enclosed but its setup for drag racing....Been looking at the 32-34' bumper pull ones.